For the sake of completeness, President Obama’s statement started out by saying: “At this challenging time of President Hugo Chavez’s passing, the United States reaffirms its support for the Venezuelan people and its interest in developing a constructive relationship with the Venezuelan government.” For the sake of context, you might also have noted that two U.S. Embassy officers had been ordered expelled from the country hours before the announcement of Chavez’s death, having been accused of conspiracy to destabilize Venezuela. No other government leader besides President Obama was put in the position of having to issue a gracious condolence statement despite having just been accused — the way his Administration was accused — of conspiracy to destabilize that country! Prof. Porzecanski has offered valuable context. Still more context could include the use of US funds to support the Venezuelan opposition (which would rankle Americans if done by a foreign government here), and the lingering distrust over the Bush administration’s premature celebration of the 2002 coup attempt against Chavez. There has been no shortage of provocation from both sides. The question is whether the US could achieve more by taking the high road. 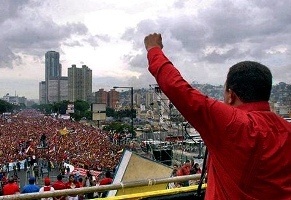 If the United States is interested in influencing the nature of government in Venezuela, it might begin by asking what will be more effective: admonitions that sound to Chavez’s many supporters like bidding good riddance to the leader they repeatedly elected, or statements of solidarity that refreshingly depart from Washington’s longstanding inclination to “teach the South American republics to elect good men” (Woodrow Wilson, one hundred years ago). Mr. Friedman “forgets” that the castrofascist regime in Cuba supports Chavez long before he got the presidency, “forgets” also that USA supported Castro with money, weapons and a huge propaganda campaign when the tyrant was fighting Batista…… and supported Castro putting aside other revolutionary groups that also fought Batista giving preference to Castro for ideological reasons……… countries and power groups always gives support to someone…… to try to present one specific supportive streams as an evil thing is not honest knowing that there are other countries and power groups working in opposite way.